The Light Microscopy Core Facility (LMCF) at Duke serves as the Light Microscopy Shared Resource for the Duke Cancer Institute (DCI). The facility offers affordable and efficient access to confocal and conventional fluorescence microscopes and image analysis resources to all members of the University and the Medical Center. The facility is based in the Levine Sciences Research Center, the French Family Science Center, the Nanaline Duke building, and Research Park II, all of which are conveniently located among Duke's major University and Medical Center research buildings. Dedicated staff provides training and full technical support for all the instruments. Trained users can access the equipment 24 hours a day. Confocals, live cell fluorescence microscopes, spinning disk, multiphoton, TIRF and more allow fluorescence imaging of samples ranging from fixed immunofluorescence slides and live cell tissue culture models, to model organisms and intravital imaging of mice. The spatial scale of imaging ranges from single molecules to centimeter-scale structures; the temporal range of events is from nanosecond to multi-week. Training is provided so users of all levels with previous experience are able to carry out imaging needed for their research. 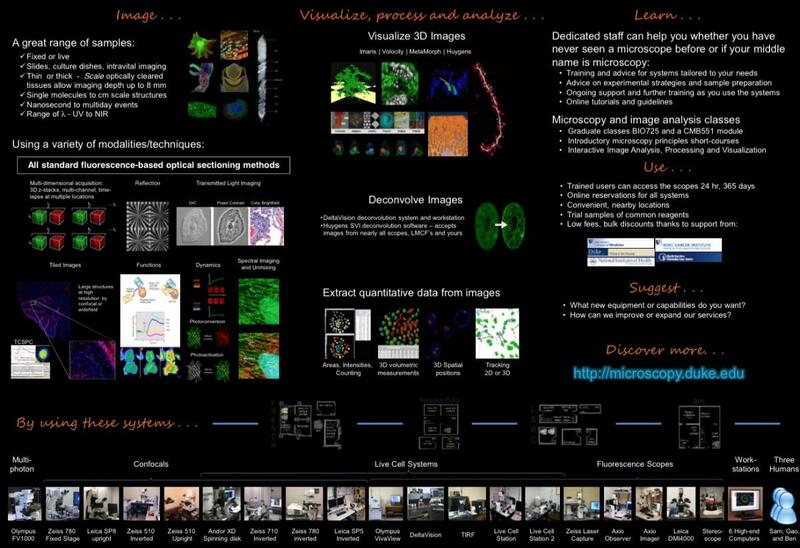 Resources and expertise for processing and quantitative analysis of images are also provided. The Facility has a wide variety of microscopes of various configurations and modalities allowing users to image a large range of samples on microscopes optimal for the needs of the sample being imaged. Over 25 resources are available in four locations occupying over 2600 square feet across the research campus. All equipment is available to all users after appropriate and adequate instruction. Trained users can access equipment 24/7/365 with online booking to make access and use convenient and efficient. 8 Point-scanning confocals - Zeiss 780s, 710, 510s, Leica SP8 and SP5s. 3 fluorescence microscopes - Zeiss and Leica upright and inverted. Laser Capture Microdissection - Zeiss UV-laser based. 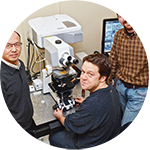 For full list of equipment, capabilities, and help on choosing the best system for your experiment, please visit http://microscopy.duke.edu/equipment.html. The facility has a range of microscopes and related systems that offer a wide array of capabilities. We generally suggest to researchers that if they have a sample that fluoresces or interacts with light in some way, we can probably image it or extract information from it. LMCF can help with live cells, fixed samples, model organisms, small animals, single molecules or at most points in between. Measurement of object intensity, size, number, etc. The facility is open to all investigators' laboratories at Duke. Users request assistance and access using an online web form. Once trained, users can make reservations and access the imaging systems 24 hours a day, 365 days per year. Booking is done on a first-come, first-served basis with some limits and restrictions to promote efficient use of the systems - e.g., 3-hour limit on daytime use of some machines so many people can use the system. Machines in general can only be booked 7 days ahead to prevent speculative booking of time. The significant number of machines in the facility provides good capacity, availability of the machines is good, and bottlenecks are generally few and temporary. In recognition of the CCSG-contribution, DCI members are prioritized for training and assistance. In periods where staff availability for advising and training new users or working with existing users on new projects is limiting, DCI members receive support before non-DCI members. Training, advice and support are provided for all equipment including image analysis tools. All users are individually trained on the machine optimal for their specific experiment. After discussion and advice concerning strategy, sample preparation and choice of imaging modality, a member of the LMCF staff works with the user to make sure they are comfortable operating the instrument to a level allowing them to optimally acquire the needed data. This training generally consists of on overview of the operation of the machine as well as specific setup and optimization of the imaging of the sample. Continued advice and assistance is provided as needed and users are welcome to use as many systems as they need. Microscopy classes in several forms and levels are available to provide background theory and a description of the potential of modern microscopy and image processing. Classes range from formal graduate classes (BIO725, BIO727 and CMB551) to informal classes covering the basics of microscopy. An interactive class where attendees bring a laptop computer with FIJI ImageJ installed and follow along with concepts and exercises in the optimal and fair processing and analysis of images is among the most popular. Further information about the microscopy classes is available at http://microscopy.duke.edu/concepts.html. Please find more information at the main facility website. If you would like to start using the facility in your research the best method to initiate contact and receive assistance is using this form: http://microscopy.duke.edu/newusers.html.